The Nevada State Athletic Commission (NSAC) released the details surrounding the fines and suspensions Tuesday in relation to the October 6, 2018 UFC 229 brawl that saw UFC star Conor McGregor lose to UFC lightweight champion Khabib Nurmagomedov immediately before a brawl broke out cage side between Nurmagomedov and Conor McGregor’s Brazilian Jiujitsu coach and Bellator MMA fighter Dillon Danis. “The Eagle” Nurmagomedov flew over the cage and jumped into the sea of spectators to sink his talons into the Jiujitsu prodigy before security quickly intervened and escorted Danis out of the arena. While that brawl was in the process of being extinguished outside the cage, members of Nurmagomedov’s entourage stormed the Octagon where McGregor himself was the target of retribution from team Nurmagomedov. It was a wild, chaotic scene as McGregor was actively engaged inside the cage after an exhausting, unsuccessful effort against Nurmagomedov by members of Nurmagomedov’s Fight Spirit team who were seeking redemption for the notorious UFC 223 media day scrum bus attack by Conor McGregor and his crew. That incident, itself a retaliation for an earlier encounter by McGregor’s teammate, the now former UFC fighter Artem Lobov who has been released from the promotion according to Tristen Critchfield in a January 29, 2019 Sherdog.com report titled, “Conor McGregor training partner Artem Lobov released by the UFC.” Lobov was confronted by Nurmagomedov in a hotel lobby after comments Lobov had made publicly concerning the amount of fights Nurmagomedov had previously pulled out of, even going as far as to question the Dagestani champion’s heart and professionalism according to a 2018 givemesport.com article titled, “The exact reason why Khabib Nurmagomedov slapped Artem Lobov in Brooklyn” by Raza Kazi. Long time MMA reporter Josh Gross reported via a January 29, 2019 Twitter post that Conor McGregor received a six-month suspension and $50K fine, while the Nurmagomedov team members who stormed the cage, Abubakar Nurmagomedov and UFC fighter Zubaira Tukhugov, both received one-year suspensions and $25k fines. 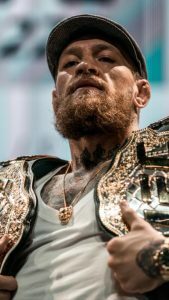 McGregor was coming off a nearly two year lay off prior to losing to Nurmagomedov, a period that saw the UFC two division champion score the opportunity of a lifetime to fight one of boxings all-time great champions in Floyd Mayweather Jr. (50-0), losing to Mayweather in 10 rounds by TKO in a crossover fight where Mayweather reportedly carried the Irishmen according to a December 7, 2017 ESPN “Pardon The Interruption” YouTube video upload featuring Mike Wilbon and Tony Kornheiser. This fight would absolutely resemble a real-life Rocky story, where an improbable fighter who doesn’t belong in there with the flamboyant, dominant champion manages to score the fight of a lifetime and takes the opportunity deadly serious while the rest of the world writes him off before the fight even occurs. Nurmagomedov would be coming to win, make no mistake about it, however unlikely his chances may actually seem to be. Mayweather is 50-0 for a reason, and should be able to handle the far less experienced mixed martial arts champion Nurmagomedov with relative ease considering it would be a professional boxing match but nobody told “The Eagle” that.